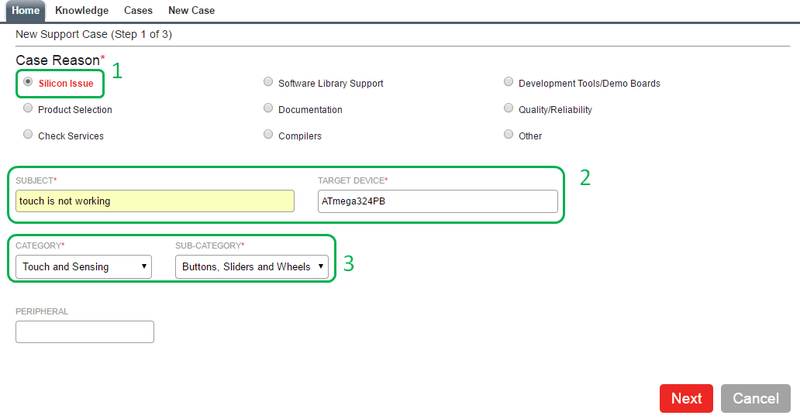 This page provides guidance to help you create a support case to get support on touch products. Design files: Schematic and Gerber. Source code: If complete source code cannot be provided, then touch.c and touch.h files. Information about the front panel: thickness and material. If available, log files of touch debug data. Go to the Microchip website. The subsequent page will ask you to log in. Provide Sign in information and click Sign In. If not already registered, select Register Now and register. After signing in, you can view your cases. To create a new case, select Cases > New Case. The subsequent page will ask you to enter the case details. Select Case Reason as Silicon. Enter the Subject and Target Device. Select Touch and Sensing as the Category and Buttons, Sliders and Wheels as the Sub-Category. Enter detailed information about the problem and click Next. Enter any additional information which can help the support team and click Submit. To attach files, select Submit and Add Attachment. Now the support case is registered in the system and will be given a number to track. Also, an email to confirm the case registration will be sent to you. Ensure that moc.pihcorcim|ylper.on#moc.pihcorcim|ylper.on is added to the safe sender list to avoid blocking of email. To provide additional details, you need to log in as explained above, select the case, and enter additional information.